Posted on August 6, 2018 by Hailey Wilson. This entry was posted in Eating Well and tagged eating well, rd blog. Bookmark the permalink. Breakfast can be rough. After you’ve hit snooze a few times, there’s not too much time left to whip up a gourmet meal. Enter: smoothies. There is no tricky prep; it’s easy to pack with nutrition; and it’s fun to sip as you start your day. That said—we’ve all endured a less than satisfying smoothie. Sometimes they’re delicious, but leave your stomach growling two hours later. Other times they’re bright green and look “healthy,” but taste on the grassy side. So what makes a good smoothie? Step 1: Choose your produce, choose your flavor. Using frozen fruit will give you a thick, creamy smoothie without needing to use any ice. If you prefer a more straw-friendly smoothie, use fresh fruit. Having a total of one cup of fruit in your smoothie is a good rule of thumb, but you can always adjust based on your taste/texture preferences. Most smoothies use bananas because they provide sweetness and a creamy texture. Use 1 whole banana if that’s the only fruit you plan to use or combine ½ banana with ½ cup of anything else. Think berries, mango, pineapple, etc. Pro tip: Buy frozen fruit! It has just as much, if not more, vitamins and minerals as fresh fruit because it’s frozen right after picking which significantly slows the breakdown of nutrients. You can also buy, peel, and freeze a large bunch of bananas to use as needed. You can even throw your overripe bunch in the freezer just before they’re too brown to eat! Step 2: Pick your liquid base wisely. A handful of spinach or kale to provide a serving of veggies! Don’t go overboard with this to avoid getting a grassy flavor. Pro tip: buy on-sale greens (found in the plastic clam shells) from the store and put them directly in the freezer. They’ll keep much longer and it’s ok to freeze them if you’re blending them up! Nut butter incorporates great flavor and fat into your smoothie to help keep you full for longer. Keep it to 1-2 tbsp. so it’s not overpowering. Oats have fiber to help keep you full. Use about ¼ cup per smoothie. The fiber in oats creates a gel in liquids, so the longer your smoothie sits after you blend-in oats, the thicker it will get. Chia and flax seeds also provide fiber and Omega-3 fats! Protein powder can also help to keep you full and satisfied, but it’s only necessary if you like the taste or if you’re using one of the low protein milks mentioned in step 2. Yogurt also adds protein, but make sure to add extra liquid in your mixture to avoid a smoothie that’s too thick to be blended thoroughly. 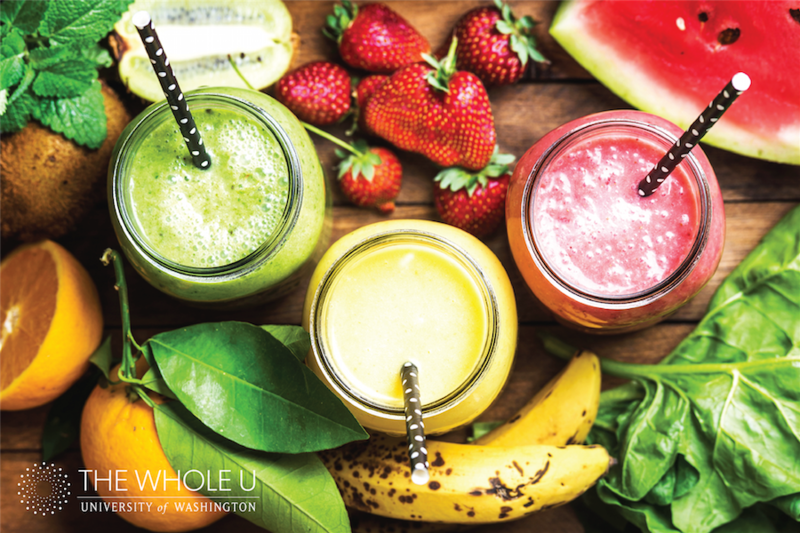 Non-leafy veggies can also be used in smoothies to produce excellent outcomes. When your veggies are about to go bad and you know you won’t use them quickly enough, put them in a storage bag and toss them in your freezer instead of throwing them away. Smoothies are a great place to hide a couple florets of broccoli that might have otherwise gone to waste. Broccoli, cauliflower, and carrots have always worked best for me! To add a touch of sweetness to a smoothie, try adding about ½ tsp. of vanilla extract. A pitted date or two can also sweeten up your blend! When making smoothies, it’s imperative to remember to balance your cup just as you would balance your plate! Hailey Wilson, MS, RD, CD, CNSC, is a Clinical Dietitian II at University of Washington Medical Center.